Jihad Watch : She hasn’t won it quite yet. And that’s not the only prize she is up for. 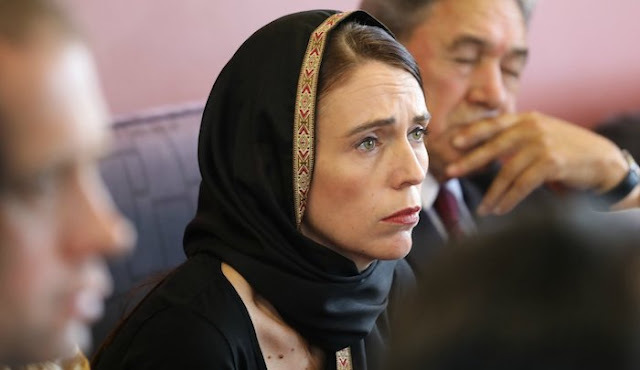 Little more than a week after the attack in New Zealand, nearly 30,000 people had signed online petitions calling for New Zealand Prime Minister Jacinda Ardern to be awarded the Nobel Peace Prize for her response to the Christchurch terror attack. That “compassion” has included her donning of the hijab during every public appearance for at least a week after the Christchurch attack, as she met first with survivors, then with other Muslims when she visited Islamic centers in Christchurch and Wellington, made a televised address to the nation expressing what would become her trademark “We Are One” sentiment, and announced that the government would not only pay for all the funerals, but provide financial assistance to the families of the victims. And the nation mourned with her, or at least all of those sorrowful faces who were caught on camera. She received praise from Muslims worldwide for her performance. Footage of her wearing the hijab, consoling Muslim women, and reciting one of Muhammad’s hadith, went worldwide. In Turkey, that outreach apparently didn’t work. Al Jazeera reported that crowds gathered in Istanbul mosques with signs reading “Crusader Savagery in New Zealand.”Tens of thousands of people paid their respects around the country with some forming human chains in front of mosques. Others said silent prayers at schools, cafes, and even offices. It has made a deep impression. Except that the hadith she recited means exactly the opposite of what Jacinda Ardern took it to mean. It has nothing to do with all mankind. It does not apply to the Infidels.